Prevalence of diabetes mellitus (DM) is rapidly rising throughout the globe at an alarming rate, where India leads with largest number of diabetics and became "diabetes capital of the world." Currently available conventional options for diabetes have certain limitations; considering which options from alternative resources are being searched to meet the need. Ayurveda, the traditional system of Indian subcontinent hold huge number of remedies that can be useful in the treatment of diabetes and associated complications. To revalidate the actual efficacy of these formulations in DM (~Madhumeha); many studies have been carried out at different research centers of India. The current attempt is aimed to compile such works done at two Post Graduate institutes of Gujarat Ayurved University during 2000-2013. These studies aimed at establishing the impact of various Ayurvedic treatment modalities viz. Shodhana (purification/cleansing procedures) and Shamana (pacifying medicinal treatment) etc., in DM. These therapies were found to increase quality of life, significantly effective and clinically safe as no adverse drug reactions were reported during the treatment period. Nutritional issues in critical care are very important for the better prognosis of patients. These concerns are further heightened if critically ill patients are admitted with co-morbidities and deranged physiology. A similar scenario is encountered when patients with burns are admitted in Intensive Care Units (ICU) for one indication or the other. Their short and long-term prognosis mainly depends on prevention of infection and maintenance of optimal nutritional status. The aim of the current manuscript is to review some of the challenging aspects in critically ill-patients admitted in ICU with history of burns. Context: Adolescence is a period of rapid transition of such a magnitude that it is associated with the onset or exacerbation of a number of nutrition- and health-related problems. Teachers and health service providers are expectedly the educated stakeholders who could provide them the needed correct nutrition and health guidance. Aims: To assess the extent of nutrition- and health-related guidance given to adolescents by their school teachers and health service providers from the perspective of adolescents. Settings and Design: The design of the study was cross-sectional. It was conducted in Block Beri District, Jhajjar (Haryana). Materials and Methods: The study was conducted on a sample of 320 students in the adolescent age group. Adolescents from the ninth to twelfth grade classes (80 from each school) were selected by simple random sampling, from four randomly chosen large Government Senior Secondary schools, with a strength of more than 250 students (two girls and two boys/co-ed Senior Secondary Schools). Data were collected on pre-designed, pretested, and semi-structured schedules by conducting in-depth interviews with the study adolescents. Statistical Analyses Used: Proportions, Chi square test, Fisher exact test, Chi square test with Yates correction, t test. Results and Conclusion: Guidance received from their teachers regarding character building and/or moral values (267/320) (83.4%), personal hygiene (278/320) (86.9%), and orodental hygiene (252/320) (78.8%), was good. Overall, the guidance on nutrition/anemia and substance abuse received from teachers was found to be (168/320) (52.5%) and (173/320) (54.1%), respectively. Guidance on issues like human immunodeficiency virus (HIV)/acquired immunodeficiency syndrome (AIDS)/sexually transmitted diseases (STDs)/Reproductive tract infection (RTIs)/menstrual hygiene received by adolescents from both their teachers and health service providers (HSPs) was found to be very low, that is, 61/320 (19.1%) and 59/320 (18.4%) adolescents, respectively. 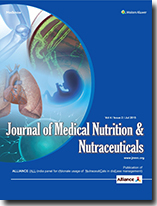 Introduction: Fish oils, containing mainly poly-unsaturated fatty acids (PUFA), are reported to be nutri-medically beneficial. There is however little or no data on the lipid contents of, and fatty acids present in, culinary fish species consumed in Umuahia, Nigeria, hence this study. Methods: The fatty acid saturation profiles and lipid contents of Scomberomorus maculatus (Mitchill, 1815), Micropogonias undulatus (Linnaeus 1766), Chrysichthys nigrodigitatus (Lacépède: 1803), Trichiurus japonicus (Temminck and Schlegel, 1844), Sardinella pilchardus (Walbaum, 1792), and Prochilodus lineatus (Valenciennes, 1836), all culinary fishes consumed in Umuahia were studied using standard procedures. Results: C. nigrodigitatus had the highest crude lipid content (21.1 ± 1.1%) followed by S. pilchardus (20.4 ± 0.6%) and P. lineatus (20.1 ± 1.0%). S. maculatus and T. japonicus had the lowest crude lipid content (~13.3% each). PUFA were most abundant in S. maculatus (40.5 ± 0.4%) and T. japonicus (39.9 ± 0.5%), but least abundant in S. pilchardus and C. nigrodigitatus (~6.0% each). Linolenic and palmitic acids were the most abundant PUFA and saturated fatty acid, respectively, in the studied fish species. 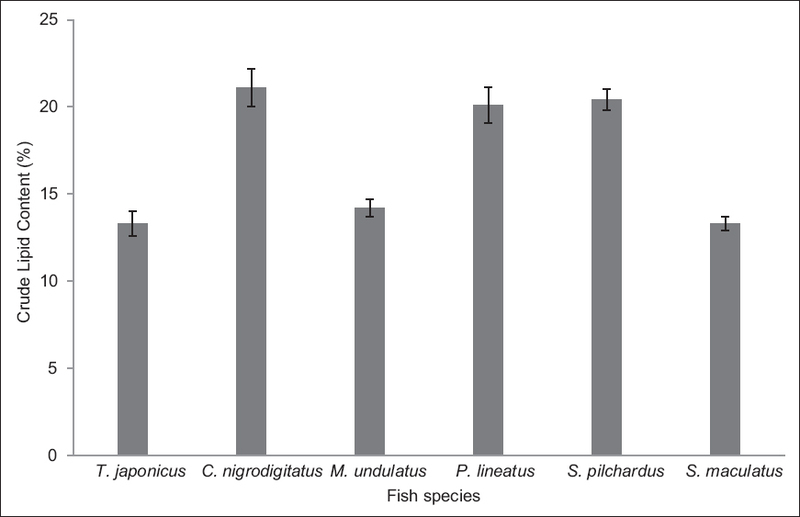 Conclusion: S. maculatus and T. japonicus are the most nutri-medically desirable fishes of the six studied species. Aim: This study involves the effect of different household processing on nutritional and anti-nutritional factors in moth bean (Vigna aconitifolia) and Sorghum (Sorghum bicolour (L.) Moench) seeds and with their product development. Methods: This study involves the effect of different homemade processing of moth and Sorghum on proximate composition and anti-nutritional factors and further development of certain products using processed moth and Sorghum flours. Results: During the process of soaking, the moisture content, and vitamin C contents were found to be increased; with a significant decrease in ash content, fat content, crude fiber content, protein content in both samples (except iron content). In moth bean, 72 h germination process resulted in a decrease in moisture content, fat content, crude fiber content, with an increase in ash content, protein content, iron content, and vitamin C contents whereas in Sorgum all the contents were decreased except moisture content, and vitamin C contents. Ash content, protein content, iron content and vitamin C content with a significant decrease in moisture content, fat content, and fiber content. After processing, the anti-nutritional factors were also decreased in both samples. The modified recipes with the processed moth bean, Sorghum, and blended flours were developed as thalpeeth and papri-chat and acceptability studies of products were carried out and compared with standard. It was found that all samples were acceptable to panel members making then quality for the potential usage as delivery vehicles for use gluten allergy, scurvy, and malnourished children. Conclusion: We can conclude that moth bean and Sorghum to our diet will help to improve the nutritional profile at low cost. Background: Even after more than three decades of implementation, the success of Integrated Child Development Services program in tackling maternal and childhood problems still remains a matter of concern. The present study was conducted to evaluate nutritional and other activities at Anganwadi centers (AWCs) in different districts of Gujarat state, India. 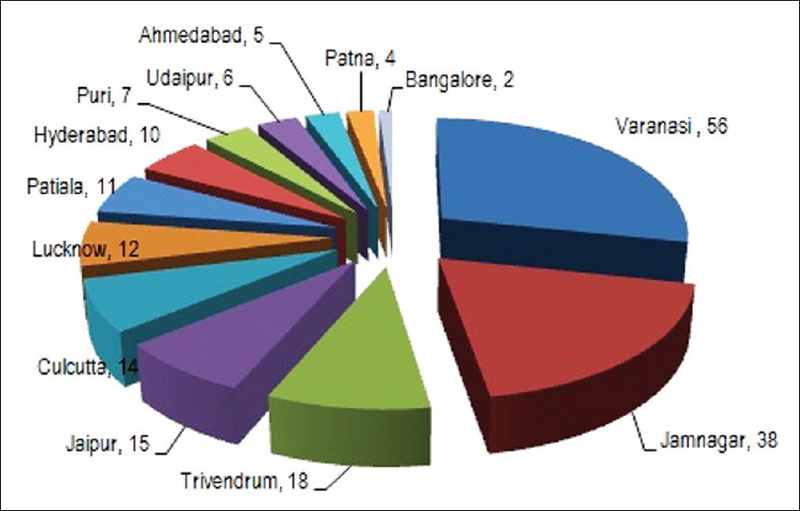 Materials and Methods: A total of 60 AWCs were selected including 46 AWCs from the rural area and 14 AWCs from the urban area during April 2012 to March 2013 from 12 districts of Gujarat. Five AWCs were selected from one district randomly. Detailed information about various nutritional activities including growth monitoring, information related to preschool education (PSE), and nutrition and health education (NHED) were collected. Results: Growth chart was present in 96.7% AWCs and accurately plotted by Anganwadi workers (AWWs) in 95.0% AWCs. Weight monitoring of children was done by using Salter scale/spring balance in 75.0% AWCs, followed by weighing pan (18.3%). Overall 18.5% moderately malnourished and 1.5% severely malnourished children were reported. PSE material was available only in 35.0% AWCs. Only in one-third AWCs, NHED training material was available in adequate quantity. Conclusion: There were gaps in the status of PSE activities in AWCs, which needs to be promptly addressed. The need for PSE should be emphasized to all AWWs. There was also a shortage of supply of PSE and NHED material at the AWCs suggesting need of regular supply of material. Background: Owing to progressive urbanization and the associated changes in lifestyle, childhood overweight/obesity is becoming a challenging problem in many emerging countries while malnutrition is far from being over. This study, which was carried out in the school setting, therefore, aimed to compare the pattern and determinants of the weight status of school-age children from rural and urban communities of Osun State, Nigeria. Methodology: A total of 300 respondents each was selected from a rural and an urban community using multi-stage sampling technique. Information from respondents was obtained using pretested semi-structured questionnaires and their weights and heights were measured and used to calculate their body mass index (BMI). Data collection was done from September to December, 2013. The BMI was used to classify them into those underweight, normal and overweight/obese using the IOTF criteria. Data analysis was done with Statistical Package for Social Sciences (SPSS) version 16. Results: The children differed significantly in their nutrition history and activity patterns according to their residence. With the IOTF criteria, the prevalence rates of underweight and overweight/obesity in the children from rural communities were 36.7% and 0.0% respectively; and 17.3% and 9.7% in the children from urban communities, respectively. Conclusion: Underweight is still a major problem among school-age children in Osun State, especially for those living in rural communities. There is also a rising trend of overweight/obesity in the urban communities in the State. A comprehensive school health program for the primary schools with emphasis on good nutrition is hereby recommended.